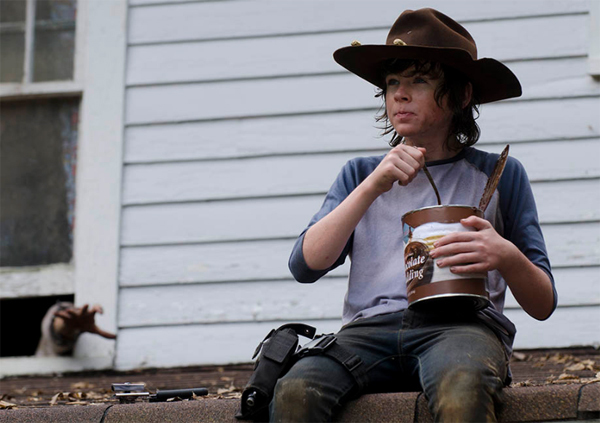 The Walking Dead cast and crew should feel free to open up a can of 112 ounces of chocolate pudding. They’ve earned it, with ratings for the season premiere the show’s second highest ever despite strong competition. According Variety, AMC’s The Walking Dead mid-season premiere “After” drew 15.8 million viewers and outperformed the Winter Olympics in the key 18-49 demo, although the Olympics did draw bigger numbers overall. The Walking Dead was also bigger than the Beatles, drawing more viewers overall than CBS’s strong Beatles special. “According to Nielsen estimates, the first episode of “Walking Dead” since its Dec. 1 fall finale averaged an 8.2 rating in adults 18-49 (10.4 million) ans 15.8 million total viewers — matching its series high in the demo while coming in a bit behind the 16.1 million who tuned in for its season premiere last October,” Rick Kissell writes for Variety. “Head-to-head numbers weren’t available, but the Winter Olympics drew about a 7 rating in adults 18-49 during primetime while drawing about 26 million viewers overall, according to preliminary estimates,” Kissell writes. The Beatles special “The Night That Changed America: A Grammy Salute to the Beatles” averaged a 2.1 rating/5 share in adults 18-49 and 13.9 million viewers, according to Variety. So is it onward and upward for The Walking Dead? Let us know what you think in the forums and the comments.